When a mysterious sickness caused the death of sheep and cattle in the central North Island, farmers were worried. But soil analysis revealed the cause – a lack of cobalt in soil derived from volcanic ash. The secrets of the soil have been unlocked by surveys, crucial for realising the potential of the land. Māori knew which soils were best for their crops of kūmara (sweet potato), taro and yam. They had many names for the soil, depending on its colour, texture and moisture. The first Europeans to arrive in New Zealand saw the lush forests and thought the soil must be fertile. But many of the country’s trees thrive in poor soils. 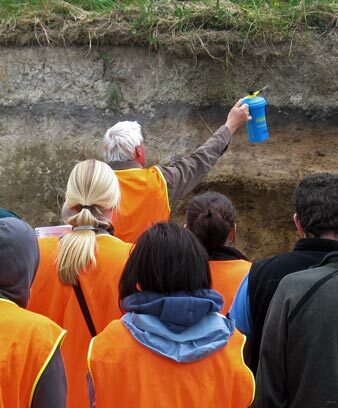 Scientists made detailed maps of soils in Central Otago and Northland. They analysed samples and grouped the soils into types, such as fertile volcanic soil. In 1926 the Department of Scientific and Industrial Research (DSIR) was set up. Because agriculture was so important to New Zealand’s economy, a group was formed to survey the soil. In the early 20th century, sheep and cattle were dying of a disease called bush sickness. No one knew what caused it. Soil scientists worked out that there was not enough of the mineral cobalt in certain soils. When cobalt was added, the disease was cured. This showed the importance of soil surveys. By the mid-20th century, soil investigations were often carried out for farmers and industries. The surveys showed which land was good for grazing animals, and which was best to plant fruit trees and other crops, or forests for milling. Soil surveys are now used for a wide range of services. They work out the flow of nutrients through a landscape, or show industries how chemicals and other waste products can be safely disposed of. Today, a lot of information about soils, climate and the landscape is held in a computer database. This can be used to make many different types of maps.